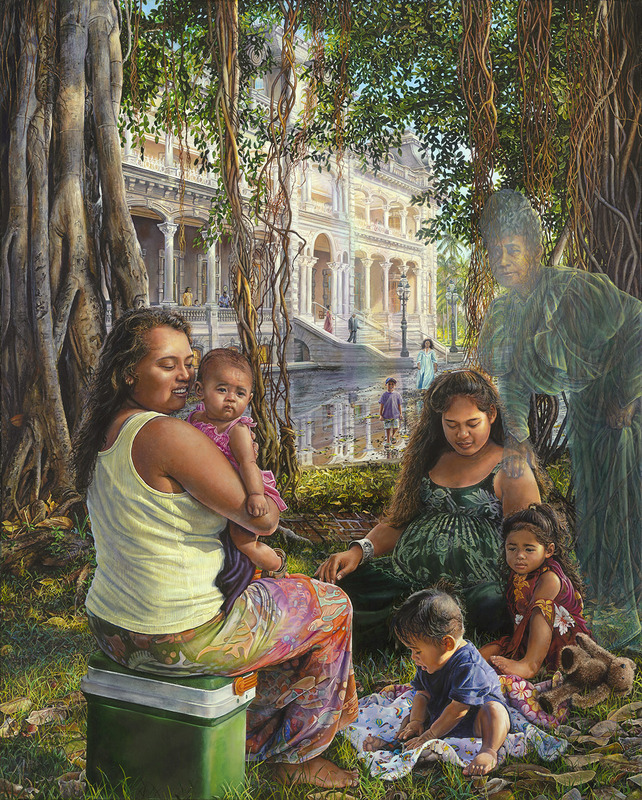 This painting is my tribute to Queen Kapi’olani (1834 – 1899), beloved wife of King Kalākaua (and aunt/hānai mother to Prince Kūhiō) and founder of the Kapi‘olani Maternity Home, forerunner of Kapi‘olani Medical Center for Women and Children. After the 1874 election of Kalākaua as king, the couple began to promote their plan. The queen traveled the islands, staging benefits and seeking donations. When their goal of $8,000.00 was finally reached, the sum was placed in trust with the interest to be used for the maintenance of the home. The physical setting of this painting is the backside of the present day ‘Iolani Palace, the palace created by King Kalākaua in 1882. He and Queen Kapi’olani lived there until the king’s death in 1891. I have chosen to paint two young mothers with their babies beneath the banyan trees on the palace grounds. These Indian banyan trees were allegedly planted in 1879 by Kapi’olani. They have spread out from the original two trees to the present day single intermeshed”monument” to a beloved soft spoken and gracious queen who had a dream – a dream to save her people. In the Hawaiian culture, the banyan tree represents procreation. The real life models are my stepdaughter, Kuuipo, with her young daughter, Kaya, and my niece, Pualani (model from the hula painting), with her two young daughters, Henua and Victoria. Both young mothers had their babies at Kapi‘olani Medical Center for Women and Children. When Victoria was only a week old, she underwent surgery to correct a heart condition; she is now a healthy, happy baby. My young grandnephew, Raymond Seabury, can be seen in the background, walking toward the little gathering.